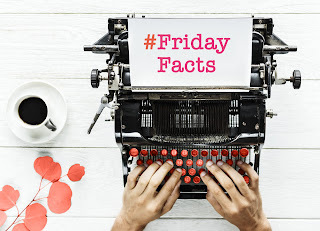 This Friday, Pict author Karen J Mossman takes us through the steps of how to send your manuscript to your Kindle. You get to a point with your manuscript where you need to step away from your laptop and read it in a different setting. But unless you've got a laser printer and a small fortune to pay for printer ink, you won't have access to a hard copy. This is where your Kindle comes in. 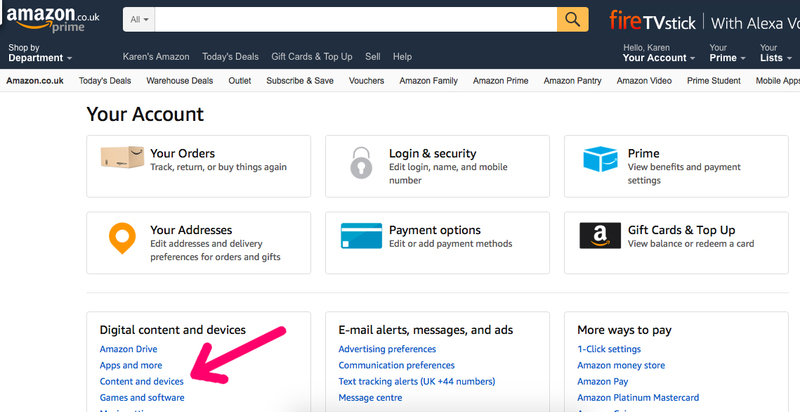 Log into Amazon and go to "your account". Bottom left, under "Digital Content and Devices" is "Content and Devices" - click here. First, we want to look up the email address of your Kindle device (or the tablet or smartphone you have downloaded Kindle reader to). Select the "Settings" tab. Under the "Settings" tab, there's a section called "Personal Document Settings" - click here. Under the subsection called "Send-to-Kindle E-Mail Settings" all your registered devices are listed, along with the Kindle.com email for each one. This is the email address you want to send your manuscript to. Open your email account in a new browser tab (so you still have your Amazon account open) and copy and paste it into the "To" box in your email account. Go back to your Amazon account. Still under "Settings" and under "Personal Document Settings", scroll down to "Approved Personal Document E-mail List". This is the list of email addresses your devices will accept emails from. Click on "Add a new approved e-mail address", add your own email account and click "Add Address". Your email address will now show in your "Approved" list. You are now ready to send your manuscript to your Kindle. There's just one final trick you need to know about. 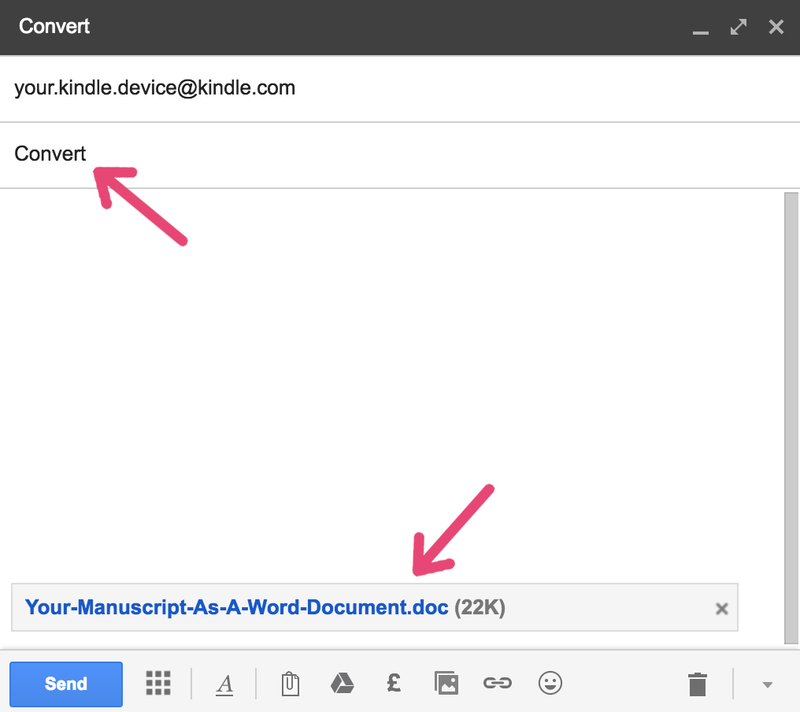 How to send a Word document to a Kindle device. 1. 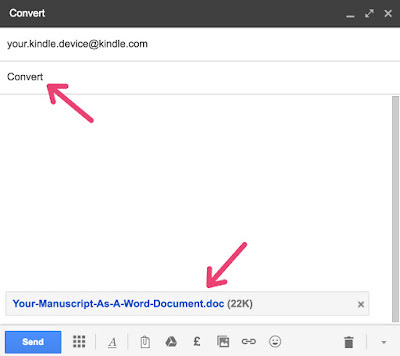 Attach your manuscript to your email as normal. 2. Type "Convert" in the subject line. When the document arrives on your Kindle device, it will be in mobi format! Now you can take a break from your desk, maybe even get out of the house completely for a change of scenery, and read your manuscript as if it were a Kindle book.